Southern California hoop fans definitely have heard of Juaquin Hawkins. As a standout player for Long Beach State, Juaquin’s stellar play helped him earn his way to the NBA. Due to a setback that cut his professional career short, Juaquin has recovered and is now lending his talents to the world of literature, which we’re glad to share with you. Juaquin Hawkins is a husband, father of three beautiful girls, a stroke survivor and a child of God. 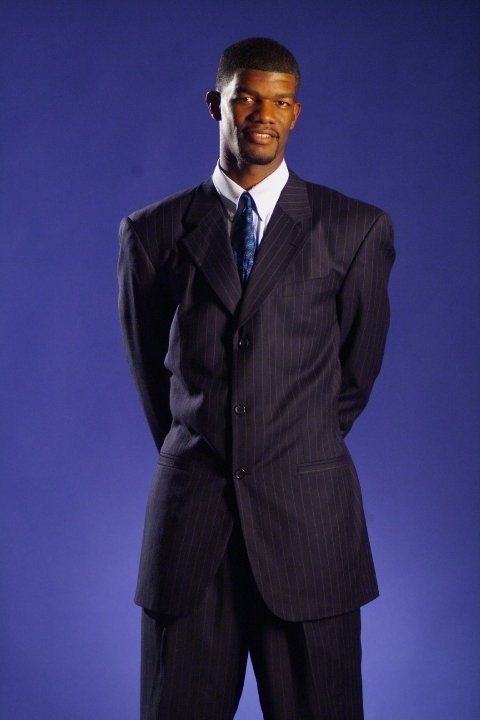 He is a former NBA player who became the second oldest rookie in the NBA during the 2002-2003 season. He has played professional basketball for 15 years, playing in 5 different countries China, Japan, Taiwan, Philippines and Australia. Currently, Juaquin is coaching 6 different youth club travel teams, and conducting youth basketball camps and basketball programs collaborating with other organization who have needs. I have been writing for 6 years. My writing developed as part of my rehabilitation from my stroke. It evolved over the years as I was trying to heal emotionally and physically. My life of events unfolded in my writing and The Stroke of Grace was officially created. What inspired you to write The Stroke Of Grace? 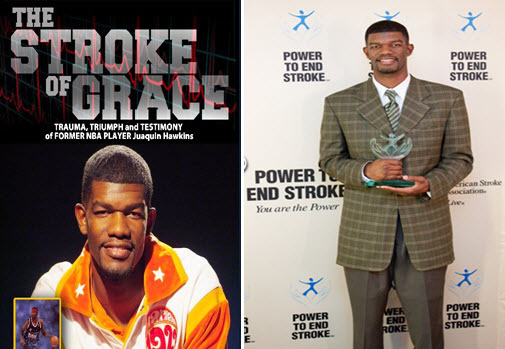 I was inspired to write The Stroke Of Grace because I want to educate and encourage others through my personal experiences as a former NBA and stroke survivor. I felt that a lot of people could relate to either hardships or success or both. What steps did you take to publish your book? Well after suffering a stroke I wasn’t enable to continue my professional basketball career like I wanted. Eventually financial hardship set in tremendously. After researching and locating the most suitable and reasonable self-publishing publisher for me I selected Xlibris publishing. Their services include editing, making minor suggestions, promotions, creating my book website and more. With their fee in mind in a couple of months of promoting my book fundraiser through my Facebook friends and parents of kids that I train I raised enough money to self-publish my book. It was 3 months of fundraising and 3 additional months of preparing my written manuscript with Xlibris publishing my book was published. My favorite part in my book is my journey to the NBA and the day I found out my lifelong dream came true by making a NBA team. I was originally told that I would be a practice player for two weeks and that the team was already set. After further questioning I was told if I could establish myself over 4 other players trying out for the team during camp for that month, then I could possible win a spot on the team. I was able to do that and even win a starting position for the first 10 games of my NBA career. I was on the team the entire year and even had my best game against another one of my idols Michael Jordan. Outside of writing The Stroke Of Grace, I understand you’re involved in other projects. Would you mind sharing what those are with us? Besides becoming an author I am a national ambassador of the American Stroke Association and travel to conduct speaking engagements to promote stroke awareness. I also coach 5 youth club AAA travel basketball teams, conduct youth basketball camps, training and collaborating conducting programs and fundraisers. Currently trying to re-establish my after school programs. How can the readers contact you if they would like to receive a personal copy? Do you have a website? What advice do you have for someone just starting out as an author? My advice is simply to take your time when writing. You can’t take back what you write so by taking your time you can take as much time as you want to express what you want to be read. I am available for speaking engagements and appearances. To book me they can contact my publicist, Tonya Carmouche @ 562-551-8277. We are also available to collaborate with other organizations for fundraisers. Thank you for interviewing me. Posted on August 22, 2014, in Uncategorized. Bookmark the permalink. 1 Comment. Great interview with someone who has something substantial to add to the conversation.